Bon Scrapatit Designs: ALL-OCCASION CARDS #9 AND #10 AND MY UNEXPECTED DAY!!! ALL-OCCASION CARDS #9 AND #10 AND MY UNEXPECTED DAY!!! HAPPY MONDAY y'all!!! I hope that everyone has had a BEAUTIFUL beginning to a MOST WONDERFUL week! 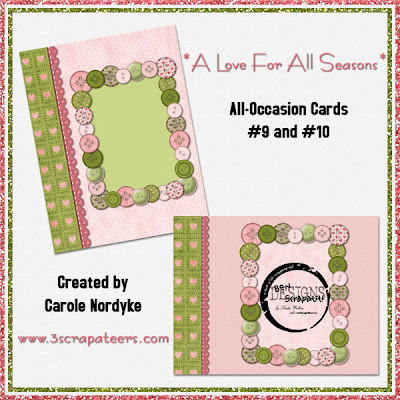 BELOW, you will find the FINAL installment of Carole Nordyke's FABULOUS "All-Occasion Cards" created from *A LOVE FOR ALL SEASONS*! Hasn't she just done a SPECTACULAR job with these? I can't wait to add some JOURNALING, print them out and send a few out for "Valentine's Day" and "Sending You Some Love" to those I've not corresponded with in a while!!! Thank you once again Ms. Carole for the sharing of your TIME and your INCREDIBLE talent!!! We LOVE you! Just a quick note on what sidetracked me today from working on any designing. I'm sure that MOST of you are already privy to the TREVOR'S TREASURE collaboration scrapkit, but I, having been SO buried in PS and preparing for our family trip at Christmastime, etc., have just found out about it today via another designer's blog. I always seem to be a "day late, a dollar short and the last to know"! I SO dislike being "out of the loop" for such a long period of time, however, sometimes such is "the life"! Anyhoo, I will be posting some information on my blog tomorrow in hopes that ANYONE else out there who may have been "out of the loop" with me or new to blog visiting, may still have an opportunity to participate in this MOST special collaboration by purchasing, TREVOR'S TREASURES, to help offset medical expenditures incurred by this VERY young family. How many of you out there have ALREADY purchased TREVOR'S TREASURES??? Please raise your hands!